A microwave is a staple addition to any kitchen. Ideal for preparing your favourite meals in minutes, it’s important that your microwave is able to respond to the daily demands that often come hand in hand with family life. 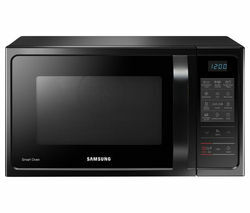 Within our high quality range of Samsung Microwaves you will find a great selection of performance focused models that will allow you to prepare meals, quickly and efficiently. Designed to make life simpler in the kitchen, Samsung is a brand that has mastered the art of manufacturing microwaves that offer optimum flexibility and convenience. From combi, grill and solo Samsung microwaves through to built in and commercial microwaves, every model has been expertly developed to maximise performance in a diverse range of kitchen environments. Delivering fast and powerful performance, many of the models within this collection feature HotBlast Technology, which has been implemented to significantly reduce your cooking times. This feature works by blowing through multiple air-holes directly onto the food, so that your favourite dishes are always cooked to perfection. Embracing the very latest innovations, every model boasts everything you need to enjoy the ultimate cooking experience, time after time. For example, you will not only be able to enjoy easy clean interiors, an easy view door for improved food monitoring and moisture sensors, but you will also be able to enjoy an Eco mode that reduces energy consumption. 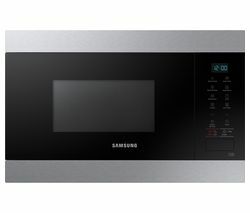 So if you’re looking for a Samsung microwave that is able to meet your bespoke kitchen requirements, you have certainly landed in the right place. Of course, if you can’t find what you are looking for, don’t worry. We also have plenty of other microwaves available from some of the industry’s leading names including Russell Hobbs Microwaves and Panasonic Microwaves. If you have any questions about any of our microwaves, please do not hesitate to get in touch.